FIRING is the process whereby clay is heated sufficiently to change its chemistry and physical structure into a new material which is inflexible, strong and resistant to hydration and heat. To achieve high temperatures it is possible to construct a kiln to increase draught and focus the heat. This is not, however, necessary to achieve a good quality product. STONEWARE has been fired above 900 degrees and is frost-resistant and rings if flicked on the rim. PORCELAIN has been fired at 12oo degrees or more to achieve its fine high tone and finish. The Viking Age potters produced EARTHENWARE which is still porous to some degree and has a dull ring. Earthenware requires at least 600 degrees for adequate strength to develop. It used to be thought that this was just possible in a bonfire but really needed a kiln of some sort to achieve. Research now shows that even simple kilns can achieve 1000 degrees and that a bonfire of wood and animal dung, not even a large one, can create temperatures of near 800 degrees. Magnetic susceptibility and thermoluminascence susceptibility studies have shown that indigenous Viking Age pottery has been fired to about 770 degrees. Traditional potters working today are completely aware of the importance of the firing process and are very skilled at creating high temperatures and specific conditions to achieve their desired result. It does not require a large amount of fuel to do this. 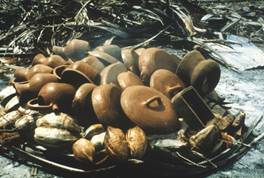 Pots may be given an initial warming by burning a small amount of fuel around them so that they do not suffer rapid expansion which may shatter them. To achieve a black finish oxygen must be excluded as the pots cool from maximum heat. This can be achieved by closing a pit, banking the fire up with a cover of dung or turf, or since the late 1800's, sealing the goods under an iron pot. 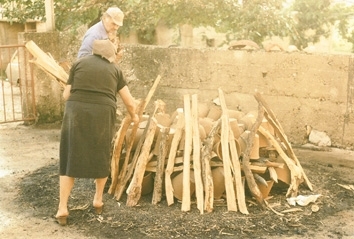 Serbian potters preparing open bonfire for firing. 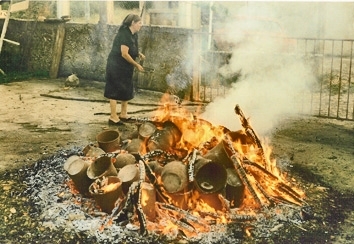 Serbian potters firing with open bonfire - nearly completed. I use the iron pot to create reduction conditions. 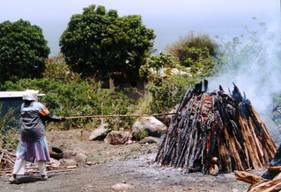 Firing with large open bonfire. Ghana. Pots being pre-heated before the main firing. Ghana. How to make a sawdust kiln to achieve 'traditional style' reduction-fired pots.